The general consensus in Lebanon is that Saudi Arabia has lost the diplomatic war that erupted in November 2017 with the surprise resignation of Lebanese Prime Minister Saad Hariri. But the long-term repercussions for relations between the two countries remain to be seen. Saudi Arabia has certainly not forgotten its grievance against Hezbollah, the Iran-backed political party and militia that has become increasingly influential in Lebanese politics. However, the recent chain of events has shown that the international community is more interested in preserving stability in Lebanon than in dealing a blow to Hezbollah or helping Saudi Arabia score points in its rivalry with Iran. This was followed by bellicose language from Saudi officials. Gulf Affairs Minister Thamer al-Sabhan said the Lebanese government would “be dealt with as a government declaring war on Saudi Arabia” due to “acts of aggression” by Hezbollah. The Saudis claimed that Hezbollah helped Houthi rebels in Yemen to launch missiles at the Saudi capital Riyadh, which Hezbollah denies. The immediate reaction in Lebanon was anxiety that the speech and resignation would lead to a fresh outbreak of sectarian violence or – more ominously – that Saudi Arabia might be setting Lebanon up for an Israeli attack by removing the leading government figure who was, at least nominally, opposed to Hezbollah. Others saw the events as paving the way for the Saudis to impose a Qatar-style economic blockade on Lebanon. Unlike Qatar, which is the world’s leading exporter of natural gas and has substantial financial reserves to fall back on, Lebanon would be ill-equipped to withstand such an economic blow, especially if Saudi Arabia and its allies expelled the hundreds of thousands of Lebanese citizens working in the Gulf. 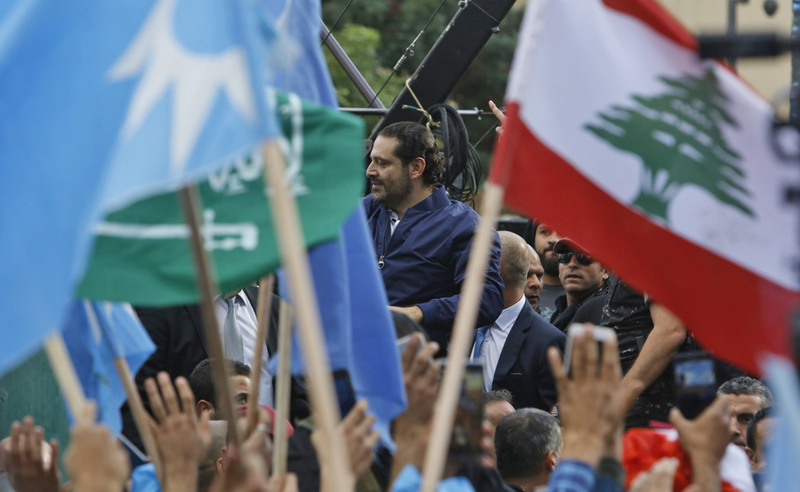 The crisis could easily have escalated, but in a rare show of unity, Lebanese political leaders – both those aligned with and opposed to Hezbollah – came together to call for Hariri’s return. President Michel Aoun asserted that Hariri, who is a citizen of Saudi Arabia as well as Lebanon, was being held hostage by the kingdom and refused to accept Hariri’s resignation until he returned to Lebanon. A popular outcry on the streets of Lebanon was joined with international pressure. Europe and at least some in the United States (US) were not eager to see Lebanon’s fragile stability shattered and the potential outbreak of yet another war in the region, particularly as the country already hosts an estimated 1.5 million Syrian refugees. In the end, Hariri left Saudi Arabia for France – of which he is also a citizen – and eventually returned to Lebanon, where he suspended his resignation and appears poised to withdraw it. The debacle, at least in the short term, appears to have had the effect of strengthening Hariri’s popularity at home, including among Hezbollah supporters who had previously regarded him as an opponent, and weakening support for Saudi Arabia. Meanwhile, Hezbollah has been able to appear reasonable by not taking the bait offered up in Hariri’s resignation speech and instead insisting that the prime minister had made the statements under duress. Aoun has played the role of statesman, unifying the country. The Saudis have not given up entirely. At a conference in Rome, Italy in early December 2017, Saudi Foreign Minister Adel al-Jubeir said that Hezbollah had “hijacked” Lebanese sovereignty and that the country will not “survive and prosper” until the group gives up its weapons – an extremely unlikely proposition at this stage. Hariri himself has walked a political tightrope since his return, continuing to deny that the Saudis pressured him to resign or held him against his will, and referring to the Saudi crown prince as “a moderate who wants to make a policy of openness for his country” in an interview with the French news magazine Paris Match. He did criticize Hezbollah’s “interference in the affairs of the Gulf countries” but also took a somewhat diplomatic tone as to the question of weapons. “In Lebanon, Hezbollah has a political role. It has weapons, of course, but it does not use them on Lebanese soil. Lebanon’s interest is to ensure that these weapons are not used elsewhere,” he said. Hariri’s rival in the Sunni community, Ashraf Rifi, has continued to voice support for Saudi policies and called Aoun and Hariri’s compromises with Hezbollah an “insult to the memory [of martyrs] who have revolted for freedom and sovereignty”. At this point, Rifi and other hardline Sunni politicians do not appear to have the support to unseat Hariri, and Saudi options in Lebanon are limited. As Sami Atallah and Nancy Ezzeddine of the Lebanese Center for Policy Studies noted in a recent analysis, economic sanctions would likely hurt Sunnis more than Hezbollah’s Shia base, particularly as Hezbollah supporters are less dependent on the state for jobs and services. As for Israel’s role, while it did not appear inclined to initiate a conflict with Hezbollah in this case, Saudi and Israeli interests are aligned in their desire to weaken Iranian influence and military power in the region. A recent analysis published by The Begin-Sadat Center for Strategic Studies, an Israeli think tank, suggested that Saudi Arabia and Israel should take the opportunity of the crisis in Lebanon to ‘deepen their secret cooperation’ and increase pressure on the US and other world powers to curb Iranian influence. They continued that Israel ‘must not fail to take advantage of the potential fall of the Lebanese government entirely into the hands of Hezbollah to prepare the ground for a future military operation in Lebanon, even if no such operation is planned for the near future’. Lebanon’s position between the regional powers remains precarious, but for the immediate future at least, it seems that calm and diplomacy will prevail.